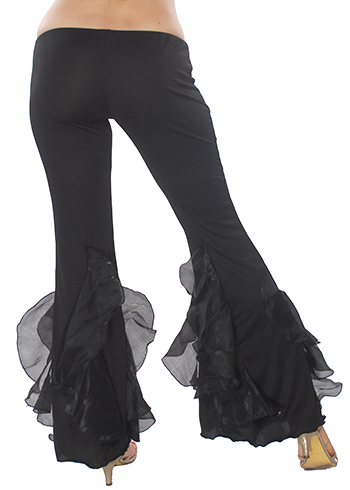 These comfortable stretch pants with a fun and ruffly bell bottom are great for tribal fusion, cabaret, flamenco fusion, and tribaret belly dance, clubbing or daily wear. These comfortable stretch pants with a fun and ruffly bell bottom are great for tribal fusion, cabaret, flamenco fusion, and tribaret belly dance, clubbing or daily wear. Made from soft, stretch polyester blend fabric. Matching ruffle choli top also available. Very pleased with this item. Pants fit very well.